I’ve been following the one word resolution for a couple of years. Last year my word was discover – and discover I did: new places, new friends, and some abilities I didn’t know I had. 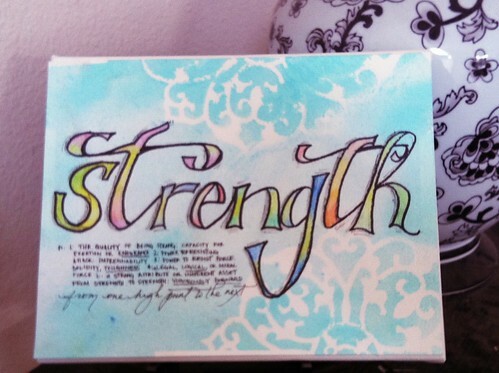 For 2012 my word is STRENGTH – I want to be stronger in so many areas of my life and I think this might just be the year to do it. 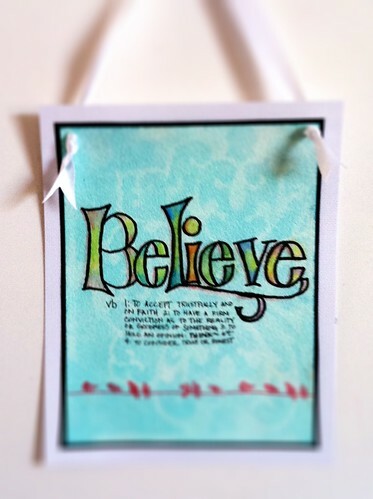 To remind me to live my word, I created this canvass to place on my nightstand, it’s the first thing I see in the morning (provided I don’t knock it over when hitting the snooze button) and the last thing I see at night. I introduced my trainer to the One Word concept and she loved it, really how could you not? She chose a word as well and as a little thank you for the constant cheerleading and pushing towards my goal I mad a similar card for her. Both pieces are on watercolor paper (had to dig deep in my stash for that) with glimmer mist, screen and water-color pencils(yep, had to dig for those too). Looking back over my limited work from the past year or two, I realized I really missed my handwriting so I am going to try to incorporate that more this year.